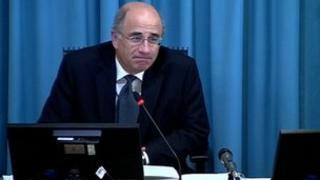 Image caption Lord Justice Leveson said the work for him and his team had "only just started"
Lord Justice Leveson has closed the last scheduled hearing of his media ethics inquiry and promised to report back "as soon as I reasonably can". The inquiry at the Royal Courts of Justice was prompted by the News of the World phone-hacking scandal. Over eight months, 650 witnesses testified in person or in writing, generating 6,000 pages of evidence. Lawyers for three newspaper groups and victims of press intrusion made their closing submissions on its 102nd day. The inquiry office said it had concluded 97 days of "sittings". In a separate development, the Crown Prosecution Service announced that eight people would face a total of 19 charges relating to phone hacking. Lord Justice Leveson told the courtroom that most people in it could "move on to other productive work" now his hearings had ended. "For me and for the team, however, we have only just started," he said. "I will produce a report as soon as I reasonably can. I recognise the urgency of the matter and the need to provide my views for the consideration of the government and all those interested parties speedily so that decisions can be made as to the way forward." However, he reiterated that he could hold additional hearings over the next few months if anything happened that he felt impacted on the inquiry's work. Lawyer David Sherborne - who represents some of the alleged victims of media intrusion - earlier told Lord Justice Leveson the press knew that it was on trial at his inquiry and "also out there in the court of public opinion". "That is why they are so scared of what evidence has been heard here," he said. "Unless someone takes a grip, a very firm grip, of the tabloid press, we will be back to the same position as soon as the spotlight is turned off and the ink is dry on your report." Often we've heard things we already knew, but even when it was more theatre than new facts, the theatre at Leveson was quite a show. It has unquestionably changed the way the press have behaved in the short term. We've heard that time and time again papers are being put together with a very high consciousness of what is going on. Lord Justice Leveson's fear, frankly, is that once his report is written things might go back to how they were. He's got to work out in a few short months how to make sure that doesn't happen and how to come up with something that makes the press behave properly, that protects the public and that is acceptable to those politicians who might have to pass new laws to put it into place. For News International, Rhodri Davies QC said the inquiry had established the Press Complaints Commission had been unable to act as a satisfactory regulator, and the company supported proposals put forward by the Press Standards Board of Finance (PressBof) for a replacement self-regulatory system. He said a "culture of clean-up" was now in place at News International. "The News of the World - a 168-year-old paper - has been felled," Mr Davies said. "The electronic cupboards have been stripped bare, there have been a lot of arrests and a host of civil claims. "These are lessons that are too severe to be forgotten and News International is determined not to have to learn them twice." The inquiry has examined the relationship between the press and the public, police and politicians, and looked at phone-hacking and other potentially illegal behaviour. The parents of murdered schoolgirl Milly Dowler and missing Madeleine McCann were among the first people to give evidence when the inquiry opened in November. It also heard from celebrity victims of phone hacking such as Hugh Grant and Sienna Miller. Dealings between current and former governments and the press were examined in evidence given by witnesses including News Corporation boss Rupert Murdoch, Prime Minister David Cameron and former PM's Gordon Brown, Tony Blair and Sir John Major. What will come of Leveson report? The coalition government also came under the spotlight over its handling of News Corporation's bid for satellite broadcaster BSkyB, while details of Mr Cameron's friendship with Rebekah Brooks, the former boss of News International - publisher of the News of the World, the Sun and the Times - were also revealed. Lord Justice Leveson's report, due in the autumn, is expected to be critical of many of those who gave evidence and suggest a new and better way to regulate newspapers in the future, says BBC correspondent Nick Higham. A second part of the inquiry, looking into the extent of unlawful or improper conduct within News International and other newspaper media organisations, will not get under way until police investigations are concluded.